First of all, I think there is an urgent need for such a book to explain who Ismailis are. I was asked this question in 1972 when I first came to Canada and I am still being asked the same question: Who are the Ismailis? The other reason for writing this book is to inform and educate the non- Muslim world, the society at large, that there are other Muslims, like the Ismailis, who, through their spiritual leader, the Aga Khan, are quietly revolutionizing the world through his humanitarian agencies, doing work in international development and improving the lives of millions of people all around the world, all in keeping with the teachings of Islam! While the Islamic militancy continues to flourish under Al Qaeda’s banner in Afghanistan, Iraq, Pakistan and in Mumbai, the Aga Khan portrays another face of Islam through his humanitarian work in international development. The work of this Islam’s modern apostle has to be publicized, the community’s basic organization has to be narrated and some of the Ismaili beliefs and practices have to be described so that the readers get an insight into one of North America’s newest and unique immigrants: the Ismailis. The world has to be told that not all Muslims are terrorists, that not all Muslims believe in killing and maiming others. There are other Muslim leaders, such as the Aga Khan, who through his world-wide community and international network of development agencies is attempting to improve the lives of people in Third World countries, through education, health, housing, architecture, economic development and cultural awareness. The book also deals with Institute of Ismaili Studies, Aga Khan University, Aga Khan Award for Architecture, Al-Azhar Park, Cairo, Egypt, Ismailis in Central Asia and University of Central Asia. As far as Canada is concerned, this book contains vital information on Aga Khan’s four monumental projects in the country i.e. 1) The Global Centre for Pluralism, Ottawa; 2) The Delegation of the Ismaili Imamat, Ottawa; 3) The Aga Khan Museum, Toronto; and 4) The Ismaili Jamatkhana and Centre, Toronto. 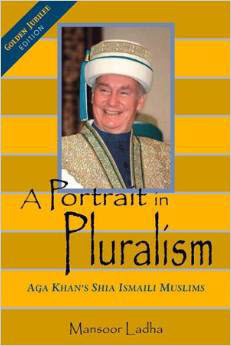 Portrait in Pluralism is perhaps the only record of current affairs available of Aga Khan’s 50 years of Golden Jubilee from the east African angle. It’s a souvenir edition of the Aga Khan’s Golden Jubilee.